Trains which have a range (i.e. a number of hexes) instead of the usual number of stops. Partially funded Corporations. They receive capital as shares are sold. Different gauge track. Track building can be at standard or narrow gauge, which can be later upgraded to dual gauge track. High building costs. The difficult terrain found on Sicily makes track building expensive, hence the need for narrow gauge track. Five or Six Corporations. The order they become available are random for each game. Electrification. E Tokens and E Trains are introduced in the Advanced Game. Two different gamekits are available, Bronze and Silver Editions. This will allow the purchaser the choice between the cost and the amount of extras (and colour printing) the gamekit will contain. Please note that all gamekits will contain colour printed maps and a full rulebook. 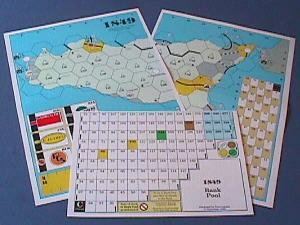 This contains the basic game components: Shares, Charters, Tokens, Tiles and Trains printed on coloured cardstock in b/w; Full colour Map and Stock Market Table; Money printed on coloured paper. What it will no longer contain is the standard 2" deep gamebox with colour box art, the 1/2" counters, ziploc bags or circular self adhesive labels. This will allow the cost to be reduced, more importantly (for me) is that the assembly time to produce the gamekit is shorter. This contains full colour Shares, Charters, Tiles and Map printed on cardstock. The cardstock is coated so the colour printing is water resistant. Money printed on coloured paper. The gamekit comes in a 2" deep gamebox with colour box art along with a number of other game aids and components. This contained the same components as the Silver Edition but all the Shares, Charters, Tiles and Train components are thermally bonded using thick 250 micron double sided matt laminate. Wooden components (pre painted 15mm diameter by 10mm / 5mm high) were supplied instead of 1/2" square cardboard counters and tokens are printed directly onto round self adhesive labels that can be applied to the wooden components.